Priced below KBB Fair Purchase Price! 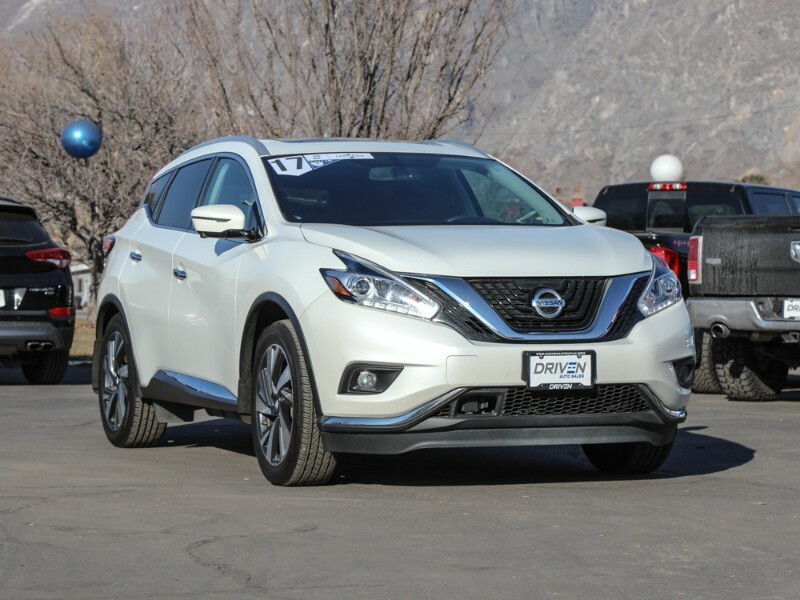 2017 Nissan Murano Platinum Pearl White AWD 3.5L V6 DOHC CVT with Xtronic CARFAX One-Owner. Clean CARFAX. This vehicle features: Panoramic Moonroof, Navigation System, HID Headlights, Blind Spot Sensors, 360 Degree Cameras, Heated and Cooled Front Seats, Heated Rear Seats, HD Radio, Push-Button Start, Remote Starter, All Wheel Drive, Dual Climate Control, Heated Steering Wheel, Fog Lights, Power Heated Mirrors, Power Mirrors, Cruise Control, Adjustable Steering Wheel, Steering Wheel Audio Controls, Automatic Transmission, Bose Sound System, Auxiliary Audio Input Jack, Touchscreen, Satellite Radio, Power Liftgate, Keyless Entry, Leather Seats, Memory Seat Adjuster, Power Seats, CVT with Xtronic, AWD. At Driven Auto Sales we find excellent cars with amazing prices and pass the savings to you, our customers. All of our cars have clean titles and are handpicked to meet your satisfaction. We offer financing options through most local credit unions and will take the time to help you find the best rate possible. If you have a vehicle you'd like to trade we accept those and would be happy to get you an appraisal. Most of our vehicles have the manufacture warranty still in place but do offer extended warranties up to an additional 5 years and 100,000 additional miles. Visit our website for our full inventory and CARFAX reports. Call/text us at (801) 477-0895 or stop by today to have a no pressure buying experience and see why we are one of Utah Counties fastest growing companies! Hablamos espanol! Para mas informacion de este vehiculo, llame o mande un mensaje a Bryson. (801) 690-7624 Visit Driven Auto Sales online at www.drivenautoutah.com to see more pictures of this vehicle or call us at 801-477-0895 today to schedule your test drive.